This is an amazing time capsule of a video. Twenty years ago this video was shot by Pete Reid and his buddy, Brian. Pete was a visiting student from Scotland at UT. 5:24 – on the left, Guadalupe @ 5th, that parking lot is where Plaza Lofts is now. 5:52 – on the left, Guadalupe @ 2nd, that white building is now where Austin City Hall is located. The camera pans to the right to show Liberty Lunch. Thanks to Pete Reid for sharing this on Youtube, and to Chris James putting it on my radar. As far as Rainey bars go, I really like The Drafting Room at 88 1/2 Rainey. Located on a plot of land right behind The Shore Condos in downtown Austin‘s Rainey Street District, and owned by inveterate downtown-er and Architect Craig Nasso since 1994 (read: WAY before Rainey Street was “cool”), the lot has evolved with the neighborhood and transformed what was an already a lovely home and office into two delightful, separate but intertwined (both are owned by Craig and Holly), pursuits of food and drink. L’Estelle’s story on it’s website is actually much more eloquently written – check it out here. The architect of L’Estelle, then 26 years old, drove down Rainey Street in 1994 and spotted a little piece of “half-lot” that was merely a patch of dirt. The fact that this lot was on a street named Rainey was especially of interest since his mother’s maiden name was Estele Rainey. He bought it, nurtured it, planted every tree and bush and designed a plan for a long life on this little lot. Twenty years ago, he built the back house as a live work office and decided to wait to build a front house when he could design it with a wife if he got married one day. The architect eventually got married, but during that period, Rainey Street changed from a residential historic neighborhood into a bustling night life district. So the architect changed plans but held sensitively to his dream. He designed and built a front house with his wife which would serve as a kitchen for the people and he converted his office into a quaint beer and wine bar – now the Drafting Room. Together, they open their yard and their hospitality to all who enter, offering a real and authentic connection to the district, its history, and the comfort casual style of gathering under the stars with good drinks, food, and folks. L’Estelle pays respect to their mother, Estele Rainey, the best cook in the family who serves as the advisor and contributor of many homestyle recipes for the preserves and sweets offered in the kitchen. There’s truly a lot to love when it comes to what Craig and his wife Holly have carefully, tenderly created. Their story is unique and their tie to the neighborhood is genuine; the architecture (and, hence, the vibe) is elegant, modern and comfortable; but, most importantly, the wine is great and the food is TO DIE FOR. Bottom line: Go there. You won’t regret it. And say hi to Holly and Craig when you visit; they are almost always there making sure things are running right. The Second Street Public Art Master Plan (part of Great Streets), in coordination with the City’s Art in Public Places program, has methodically been placing art in around the district since the mid-2000s, when 7 sidewalk enhancements were commissioned at district intersections to reflect a unified theme. The City of Austin has a 2% for art ordinance that was established in 1985. Art in Public Places (AIPP) is celebrating its 30th anniversary this year and Austin was the first municipal public art program in the state of Texas. Under the ordinance, 2% of eligible capital improvement project budgets are allocated for the commission of public art for that site. The projects in The Second Street Public Art Master Plan are under that envelope of funding. How Much Convention Center Is Too Much Convention Center? Block 8 sits in the southern shadow of the Four Seasons Residences, just west of the Austin Convention Center. There are signals that the City of Austin is posturing for another Convention Center eminent domain battle (à la the Whittington Saga Part 1 & Part 2, which we wrote about in 2008). City Staff recently recommended that the City acquire the southern tracts of what’s known as Block 8 to be part of an expansion of the Austin Convention Center, the first step in a larger proposed expansion. The Convention Center currently sprawls over six city blocks, and hosts 881,400 square feet of space. The City Memo states that there is “solid evidence” for expansion and is wanting up to 305,000 in additional square feet! No doubt the abundance of downtown hotel rooms recently built, and under-construction is part of that “evidence”. You can view the memo in a recent report from the Austin Monitor, though talks about this have been going on behind closed doors for a while before this. 101 E Cesar Chavez / 302 E Cesar Chavez – this is one of the most awkward buildings in downtown Austin. The tenant, Casa Chapala, recently closed its doors. Public records show the lot to be owned by Bloctavo Holdings LLC / John Calhoun Miller, a real estate attorney in Texas. May be a registered agent. 304 & 306 Cesar Chavez – downtown’s purveyor of Aprilias and Vespas, AF1 seems to hide in plain sight. Owned by Bandy Real Estate LLC, a family operated LLC located in Kingsland, TX. 316 & 316 1/2 Cesar Chavez – A lovely surface parking lot (sarcasm), adjacent to the Christian Science Reading Room. Public records indicated this is owned by Bloctavo Holdings / John Calhoun Miller, a real estate attorney in Texas. May be a registered agent. 102 / 104 Trinity – The Christian Science Reading Room, owned by the First Church of Christian Science. Southwest Strategies has been marketing the assemblage of the southern half of Block 8, hoping to get a developer to build with a long-term ground lease. The Block 8 Tracts are an assemblage of 4 smaller tracts. Currently, the western portion of the property along San Jacinto is improved with a two story building containing 6,103 sq. ft. currently leased to a restaurant on a short term basis. The central part of the assemblage is improved with a one story building containing 5,320 sq. ft. Tenant is on a month-to-month lease. The eastern portion of the assemblage consists of a paved parking lot utilized for contract parking and an owner occupied one story building consisting of 4,161 sq. ft. In their memo, the City states that it has already sent what’s called a Letter of Intent to Acquire to the property owners, and is also already throwing around eminent domain references (though the memo does state that the City will make a good faith attempt to acquire the properties at market value). As a resident of downtown, the prospect that an additional three to four blocks of CBD zoned downtown Austin land, currently occupied by thriving businesses, would be annexed by a sprawling Convention Center is alarming. This would divide downtown Austin using brute force malaise-era design principals. The City should instead be investing in sustainable design that enhances the preciously compact pedestrian experience our downtown currently affords to residents and visitors. I call BS on the dogma that Convention Centers can only expand horizontally. City leadership should invite world class designers to show us a better path to expand vertically on the already significant Convention Center footprint. It looks like Rainey Street District will be getting a history center! The big question is: where will it go? 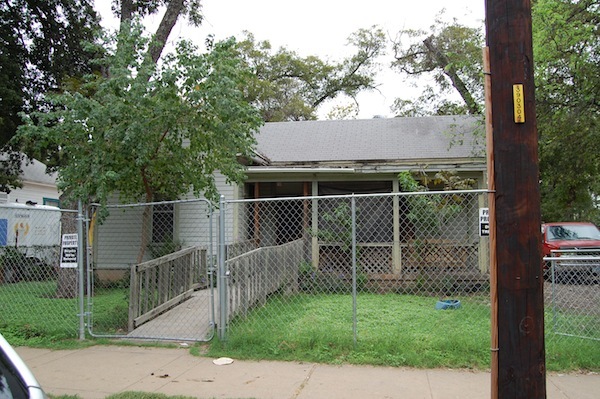 Directs the City Manager to accept the donation of the structure formerly located at 93 Rainey St. from Austin Rainey St. D/E/P, LLC, a Delaware, LLC., for use as the Rainey Street History Center. Here’s the house at 93 Rainey in 2012 (taken from my MEGA Rainey post from 2012) – standing on one of the sites where Dinerstein is building the Millenium Apartments. This structure, which will be refurbished using funds from the Rainey Street District Fund, will be placed on a TBD location within the next 180 days. There are pros and cons to each of these sites, and the Rainey Neighbors Association will be discussing all the issues, and likely selecting the location THEY endorse (several other stakeholders may need to agree, including the MACC and the Waller Creek Conservancy) on 10/21 at 6:30pm at the Towers of Town Lake Library. If you are an RNA member – you’re welcome to come to the meeting! Otherwise, submit your thoughts on these sites in the comments below!